A lot of projects go through our workshop each year & there are times they’re just a blur to our master craftsmen. 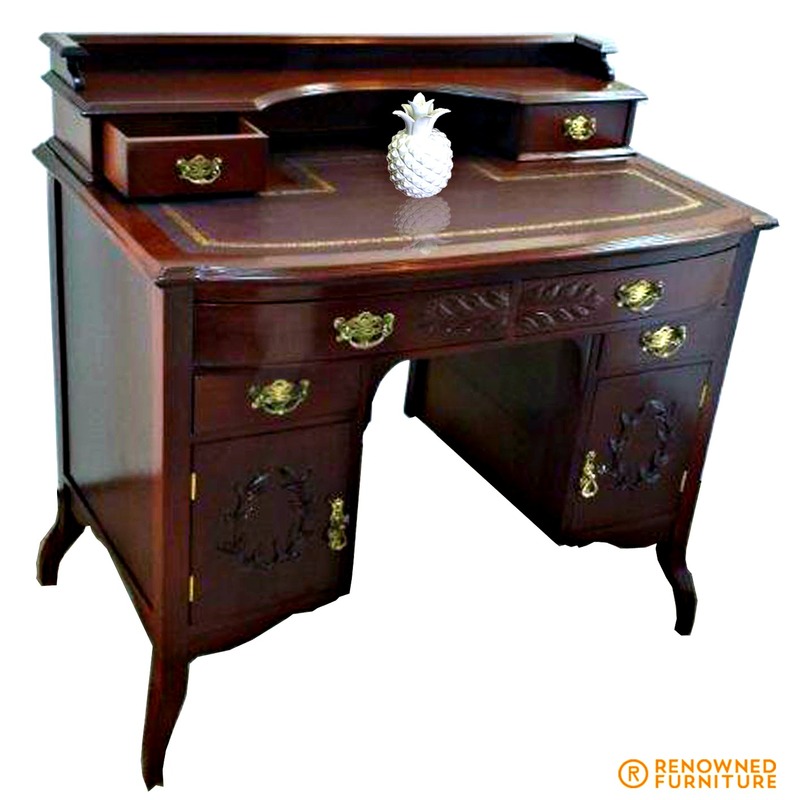 We appreciate that our customers feel an amount of sentimentality, even love, for their furniture that’s why they come to us to bring them back to life instead of simply trading the old with the new. No matter how many chairs, tables and other pieces of furniture come our way, we remember them all – some more than others. We remember their specific story, the challenges that went with completing each piece, and the little notes of thanks we get from their owners. 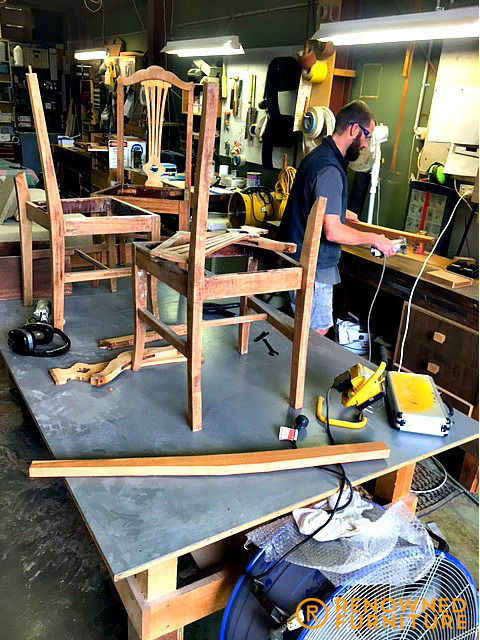 This project was part restoration, part rebuilding – 6 dining chairs. All 6 were restored, but 2 had broken back rests, so we hand crafted and replaced them. 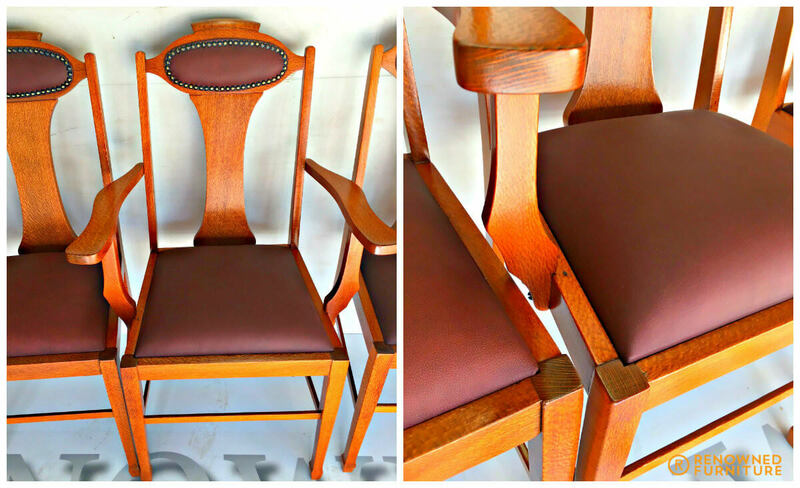 These chairs have some of the most amazing grain character we have ever seen. The owners were debating whether to just buy new ones, but since the chairs have been in the family for so long, sentimentality won! 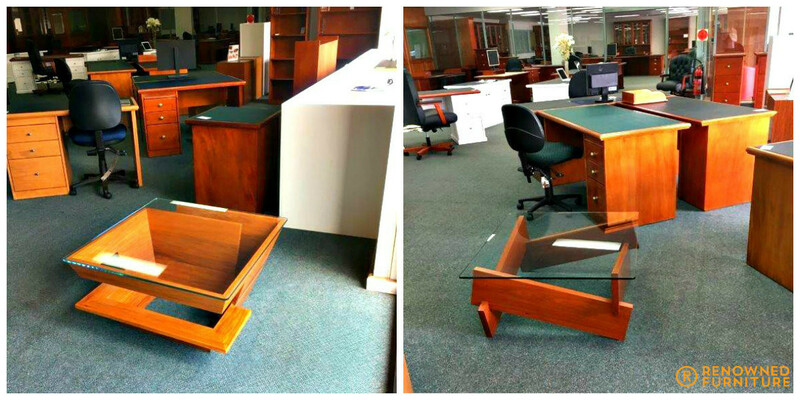 “We don’t see pieces like this often.” was what we first thought when this dining table was rolled in. 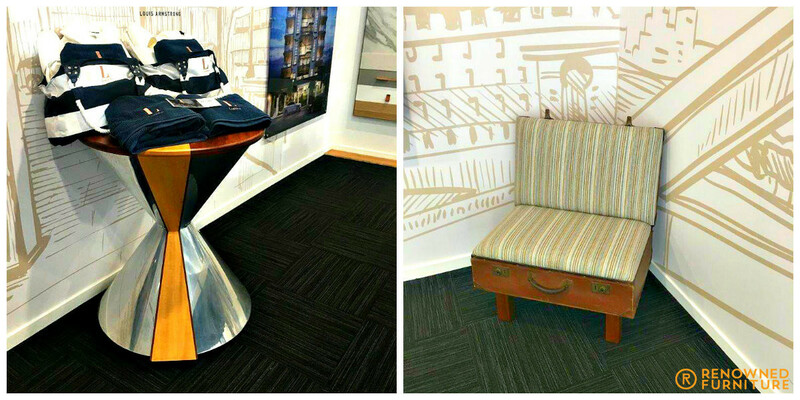 It’s a fine example of mid-century craftsmanship and design and our Captain’s Choice Award. 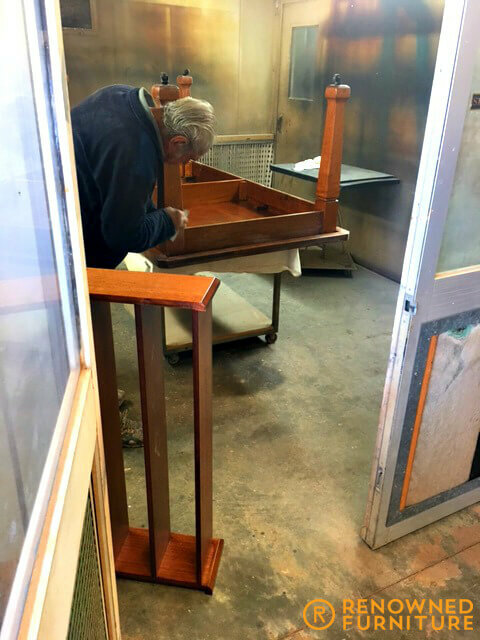 With each restoration job we do, a feeling of newness and fond memories resurface – this is why we make sure we can say each piece of furniture we work on is “a job well done” – and we remember. We have the pleasure to welcome our newest team member, Lachlan, who’s come on board as a first-year apprentice furniture maker/craftsman. 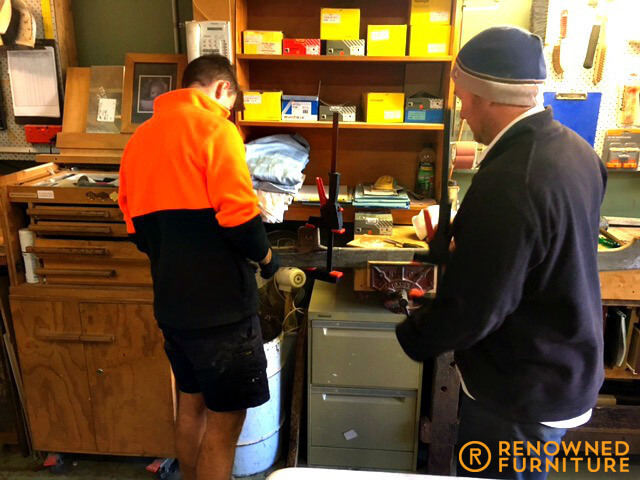 With the work flow continuing to grow and the word spreading that Renowned are among the finest custom furniture men in south east Queensland, we are enjoying a sold order book, plenty of fill in work such as fine furniture restoration, and some solid growth from our big corporate clients. In fact, the largest of our corporate clients involved nationally in high-end corporate fit outs has recently warned us to “fasten our seat belts” as they have firm orders for the completion of no less than 10 new and refurbished office spaces, with at least five of these requiring big involvement from Renowned Furniture to supply boardroom furniture, CEO’s office furniture, etc. All custom made, all high-end! We had Lachie on for a 3-month period where he was released from school duties on day a week and could attend the workplace here, and between both parties, we decided that something a little more permanent would work out nicely for us all. 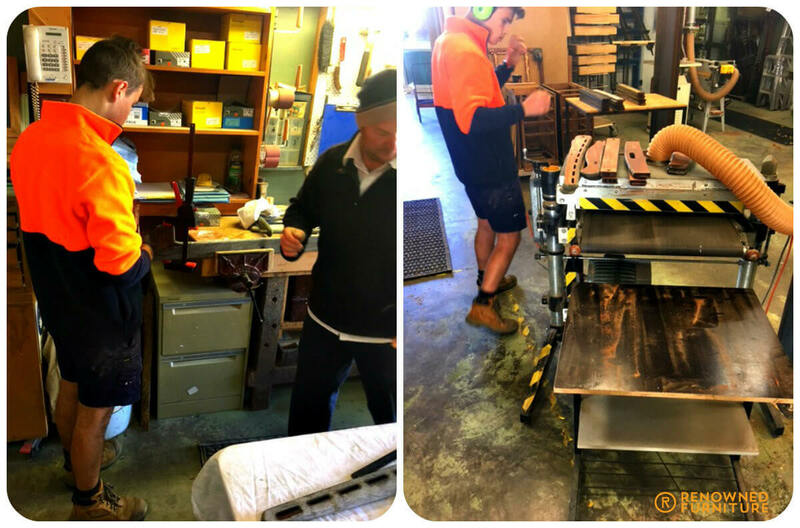 Having had a passion for timber work and including manual arts into his school curriculum, Lachie has proved to be a valuable addition to the team here at Renowned Furniture. “He pretty much hit the ground running”, one of the master craftsmen said. Our guys are impressed with his “self-starter”and “thinks for himself” qualities, and often, it’s the little things that go a long way. So, good luck Lachie and welcome! 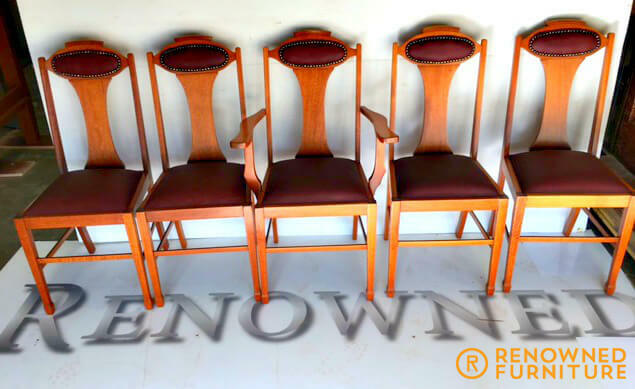 http://renownedfurniture.com.au/wp-content/uploads/2014/12/logo1.png 0 0 Ross http://renownedfurniture.com.au/wp-content/uploads/2014/12/logo1.png Ross2017-07-13 12:19:012017-07-13 12:19:01Welcome to our Newest Member! 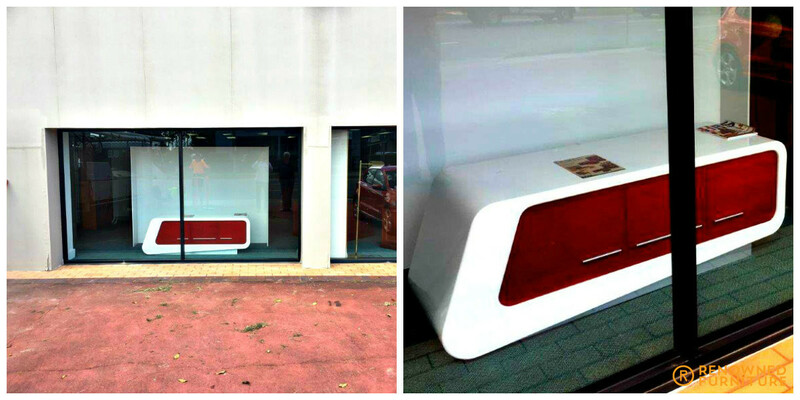 Interesting Time Ahead for Renowned Furniture! It seems we might have reached a level where we are beginning to come into the view of some industry colleagues working within a similar space as Renowned Furniture. We were recently approached with a question: Are you interested in selling your business? Following some early questioning, we realised that it was a genuine request, and so we opened up some discussion. Don’t panic! We’re not going anywhere. The team is toiling away with a wide range of projects at present. By the way, what’s with the new rush on CD/DVD racks and holders? They must have reached ‘retro’ status or something because we’re currently getting quite a few enquiries for them in many and varied shapes and forms. We are now into some of that, well, “you simply can’t find” pieces. Anyway, I digress! Back to the story, the discussions centred around a purchase of the business running as it is and we have to say that there is some merit in considering, in the very least, some kind of partnering with another ‘like-minded’ person or group, so that the growth and coverage we are dealing with could be more evenly covered in a controlled manner. We have some great team members; have just signed up a new apprentice and are staring at a great start to the new financial year with jobs on the books and at least two very large projects ($2M plus each) that we are growing quietly confident of winning. Well, at least one of them anyway! We wish all our readers well and hope we can rely on the same kind of support for the 17/18 financial year that we have appreciated and enjoyed for the past 12 months. http://renownedfurniture.com.au/wp-content/uploads/2014/12/logo1.png 0 0 Ross http://renownedfurniture.com.au/wp-content/uploads/2014/12/logo1.png Ross2017-06-29 12:56:402017-06-29 14:06:20Interesting Time Ahead for Renowned Furniture! Well, we finally did it! Renowned now generates enough of its own power to not require any from the grid. 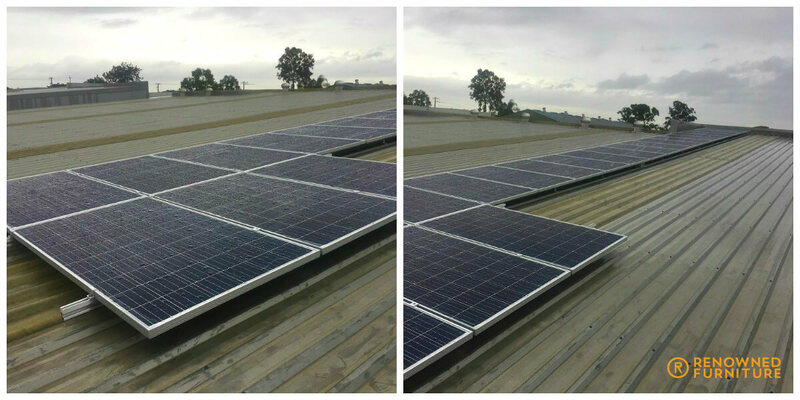 These pictures are a look at the large, 3-phase inverter and one of the banks of solar panels. Even performing very well during a rainy day given the reduced light. Because a factory like this does not use very much power after hours (when the sun’s down) we are well poised to add battery storage and never need to call for external power ever again. We scoped the system up to be strong enough to withstand our peak loads. For example, when our 2 massive compressors are on start-up, the large, 3-phase dust extractor system is running and any number of panel saws, routers, sanders and air conditioners are running. 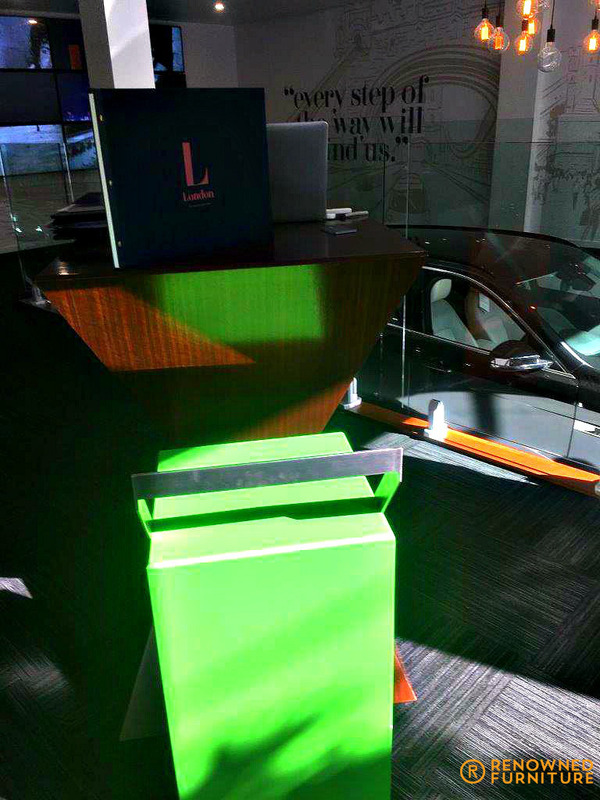 This, together with all the lighting, office equipment, fridges and so on, is all complement of the sun! 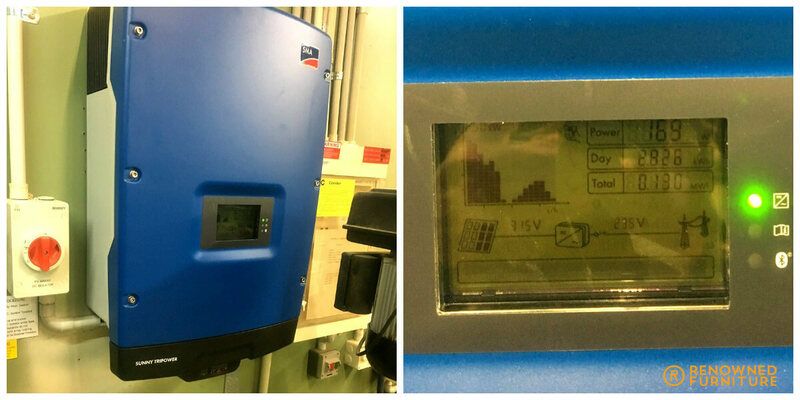 Our return on investment sits at about 3.5 years and the warranty of the components is 20 years for the panels to continue to output at least 85% of their rated output as well as the German-made, 3-phase inverter that carries a 10-year guarantee. We are proud of the ‘green tinge’ that this small initiative adds to our products and services, and we will be mentioning this in all our future proposals with zeal. 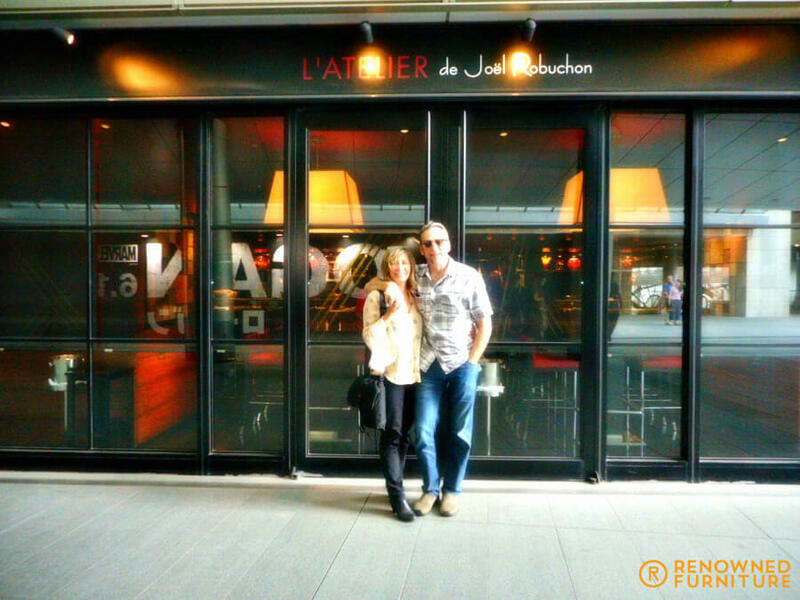 We’re saving so much money, my wife and I decided we should sample the fare at a fine restaurant in Tokyo (one of the finest chefs in the world!) on our way home from visiting our daughter in the UK. Thanks to all our clients for their loyalty, and we can assure you of a well recharged management team ready to continue providing you the “wow factor’ to all your fine furniture needs. These days the art of showing off the grain character (especially if the timber has been “Quarter cut”) is the best method for a truly ageless finish and style that goes with just about anything. 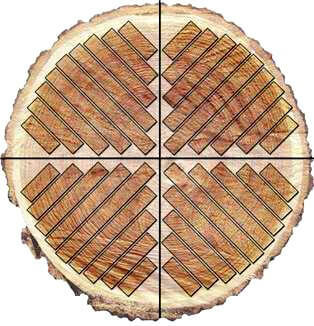 It’s a way of getting the most grain character out of a piece of timber, and silky oak is one timber that can truly shine with a finish when the timber has been quarter cut from the log. 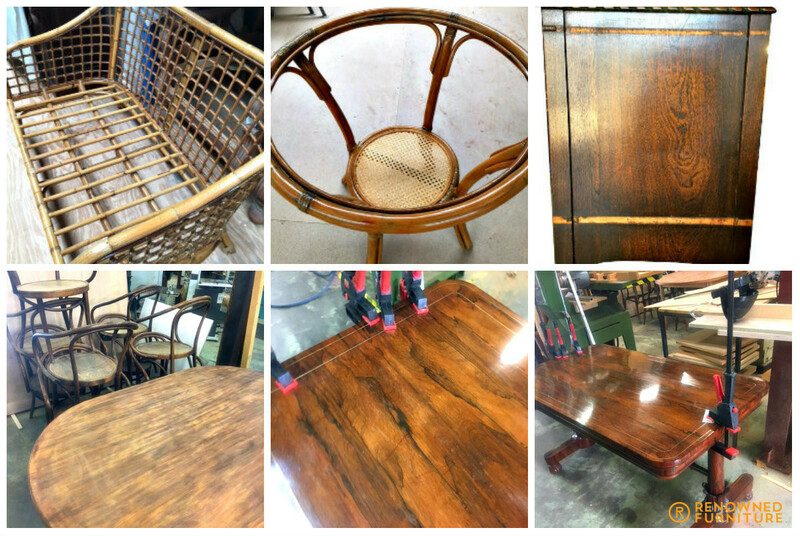 We’ve restored several tables, chairs and dressers, etc. for this good folk and this set of 5 chairs would appear to be nearing the end of a beautiful relationship! Well, our guys are hopeless romantics and it seems that the fifth chair just sailed through the same process so that the boys did not have to “leave a chair behind.” We agreed to provide the restoration of the fifth chair as a goodwill gesture to our client to acknowledge the great support and good custom we’ve enjoyed over the past couple of years. 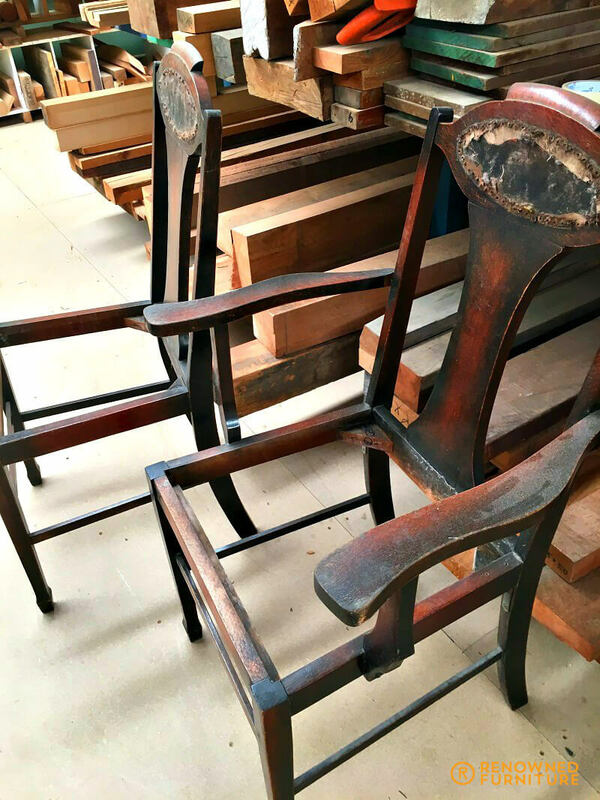 Even the grandchildren forked out heaps of dollars getting their own respective, inherited pieces done up to their former glory, so we can see the dedication and the fine taste that all these guys have for old furniture. One of the approximately 15 to 20 pieces we see every month have been damaged by removal companies. Great business for us, but I can’t help feeling like there’s room for some formal training in furniture relocation practices. It’s really not brawn that’s required for this job; there’s a process. It includes, but is not limited to, site and furniture evaluation, route planning for movement of the various pieces, etc. There is also the proper application of protective wraps, blankets, etc. This phase is so important. You must have some basic knowledge of the types of finishes that exist and be able to identify them as they relate to various pieces of timber furniture before you start applying packaging wraps and tapes, etc., correct placement in the transport vehicle, load securing and the perfect reverse of all of the above once you reach the destination. It’s not rocket science but done correctly, it’s a smooth, efficient flow where money can be made without incident. 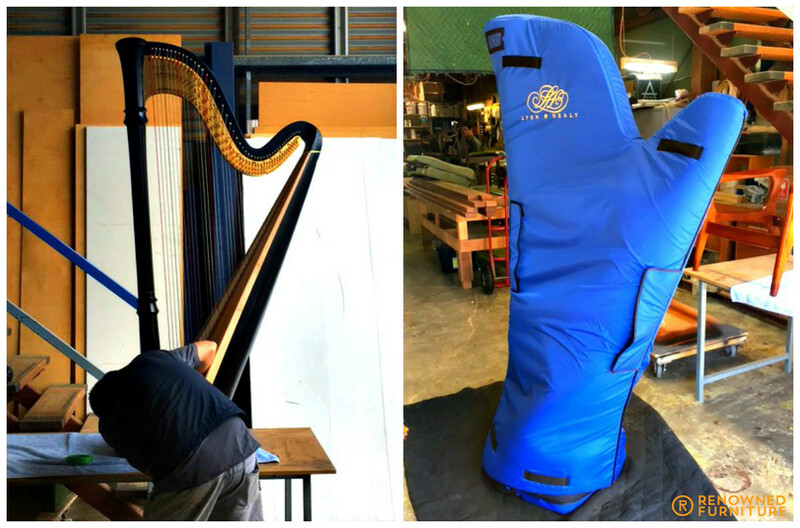 We recently did a job for a client that had purchased a $30,000 concert harp from the USA and it arrived with the black ebony finish to the main body, covered in subtle round circles! A quick evaluation by us and we determined that the first layer of “protection” that had been applied for transport/shipping was bubble wrap. They killed it with kindness and clearly lacked any knowledge of the potential reaction that plastic and humidity would have on the black ebony finish. 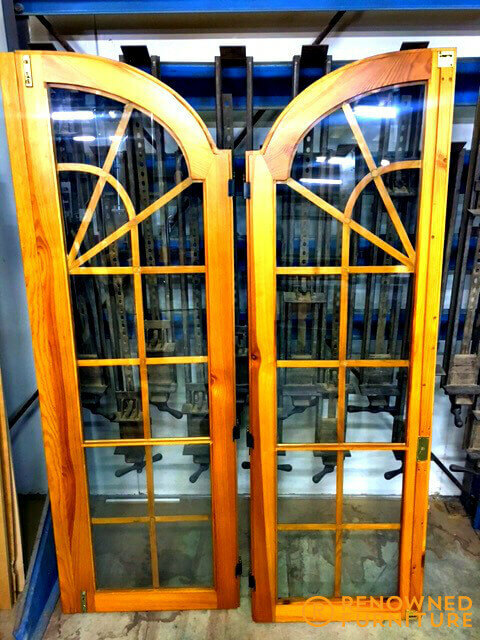 We also came to the rescue of a son who got these doors as a present from his mum. The doors arrived from overseas broken in 15 places and he wanted them looking brand new again before his mum arrives. We took up the challenge and had the doors ready in time. I could go on forever about the myriad of mistakes that are made in this industry through lack of understanding about process and proper treatment of the many various furniture finishes. Our latest ‘product placement’ venture is with a company in the same industry. 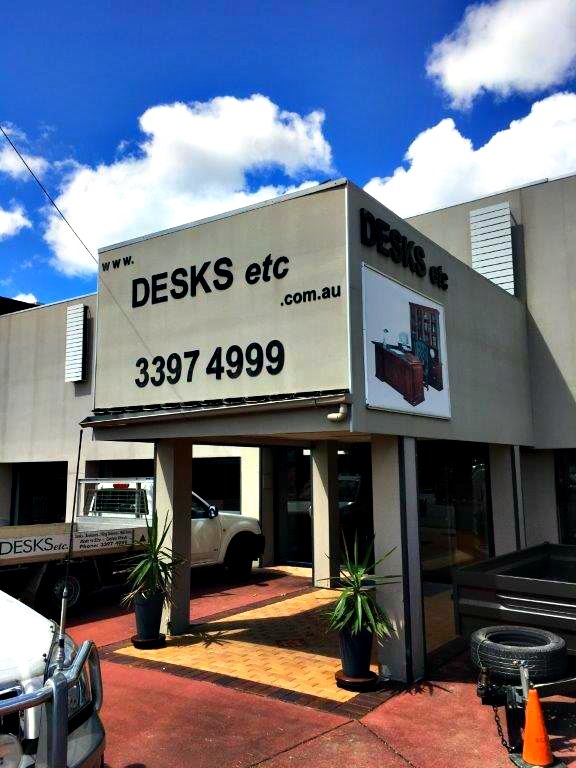 Desks Etc have been operating for more than 30 years and make some very fine office style furniture here in Brisbane. 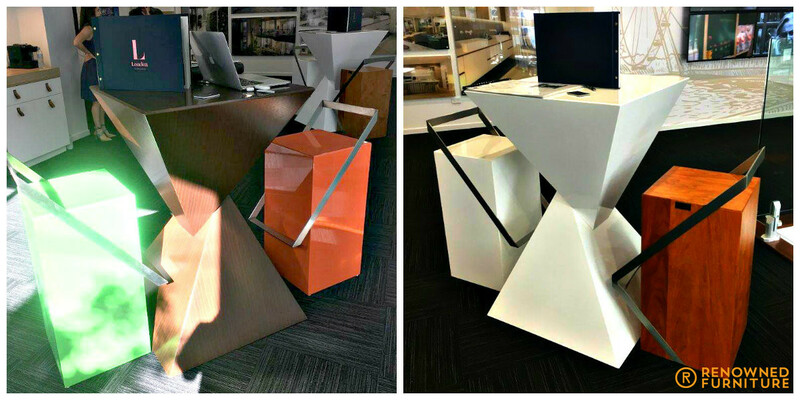 We’ve had a collaborative partnership for some time now with Desks Etc, and both parties felt that there might be some synergy between our companies with regard to the more ‘creative’ and custom pieces that Renowned Furniture are known for. Under a “nothing ventured, nothing gained” approach, we decided that showcasing a few of our more creative pieces in the Desks Etc showrooms located in Coorparoo would be, if nothing else, a fun talking piece for some of the visiting clientele to the Desks Etc showroom, and for us, a little bit more exposure to the mainstream looking for fine office furniture. We’ve had some highly successful dealings with Desks etc over the years and we’re happy to say that the levels of trust between our groups is the foundation of a healthy relationship that provides mutual benefits. We’re industry colleagues rather than opposition companies and we look forward to a continued friendship. 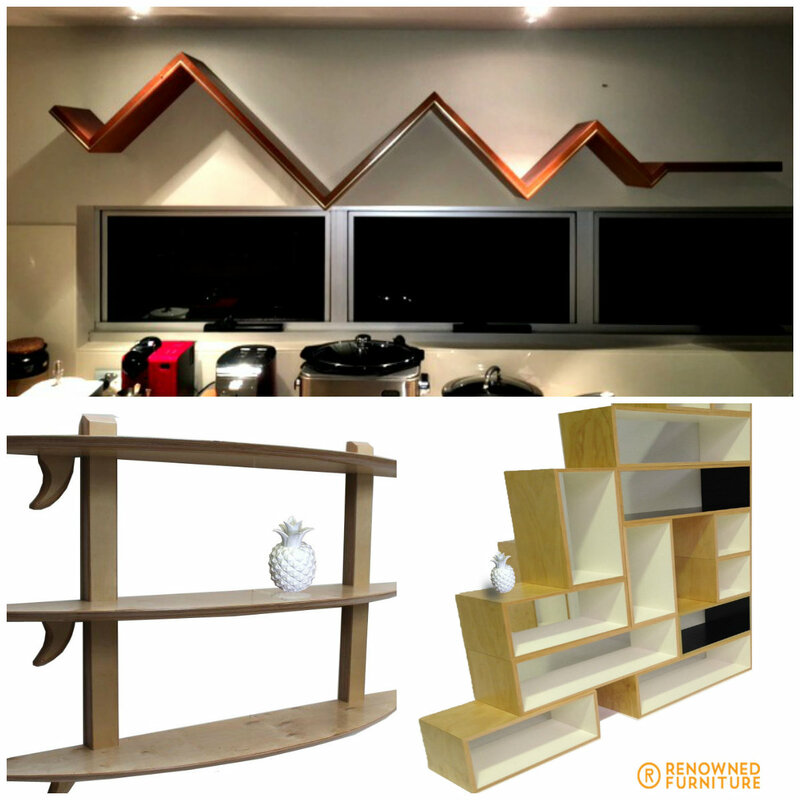 As a start, we have supplied the “Coravano”, a 2 pack white and red credenza; “The Stack”, a spotted gum and glass coffee table designed to look like a set of old planks thrown on top of each other to create a base; and “The Inca” coffee table, an origami inspired timber frame that looks more like it’s been folded rather than joined – star sapphire glass and New Guinea rosewood.